Happy Halloween! Well, almost- it’s tomorrow! With the holiday coming up quick we thought we’d help you guys out by sharing a few of our favorite last minute Halloween costume ideas. Don’t have any idea what to dress up as? Are you a born procrastinator? Don’t worry, we’ve got your covered. Feeling like making an entrance at your Halloween party? This parrot costume (modeled by our lovely friend Erin) might be for you! It’s a natural choice for the extroverted party-animal: all eyes will be on you! And best of all, all you need is some colorful clothing, feathers, and chalk. To create this look check out our hair chalk and parrot makeup tutorial videos. 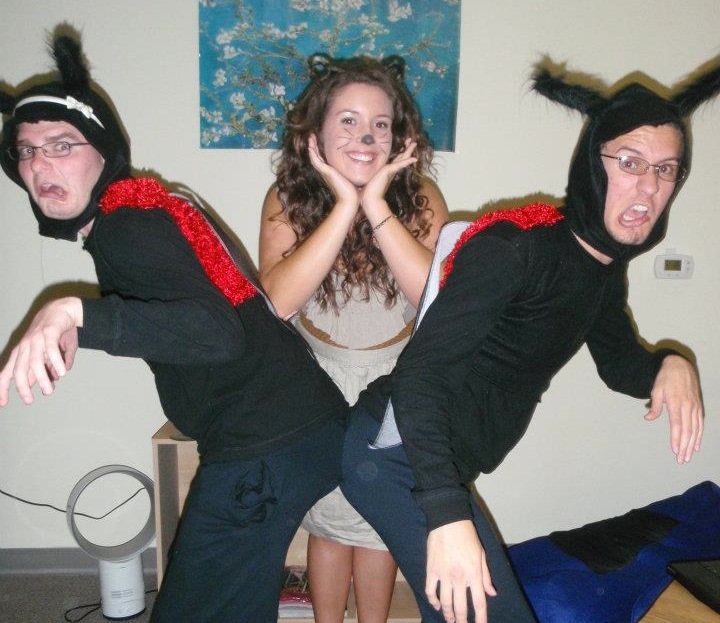 This costume literally took us 10 minutes to make and cost us $8 collectively. Flo’s Costume: All you need is a white apron (I bought mine from JoAnn Fabrics), blue ribbon, and computer paper to print out the Progressive logo, her name tag, and the “I heart insurance” button. Then cut them out and pin them on your shirt. Mayhem: Wear a suit and buy butterfly bandages to put on your face. Take a little lipstick and dark eyeshadow to make yourself a little bruised and you are good to go! 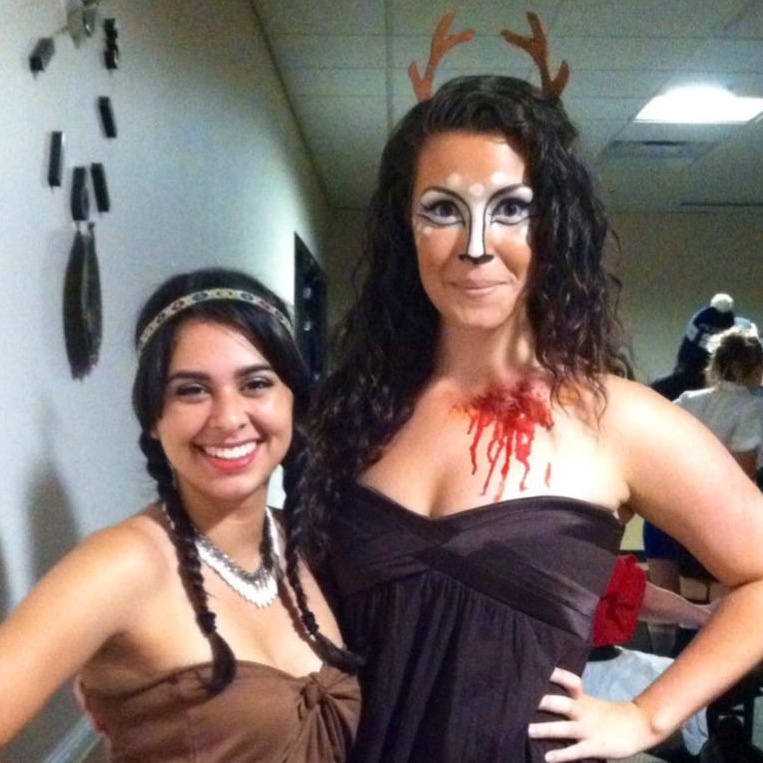 Maybe you’re looking for something a little more culturally relevant- why not try this Game of Thrones costume? 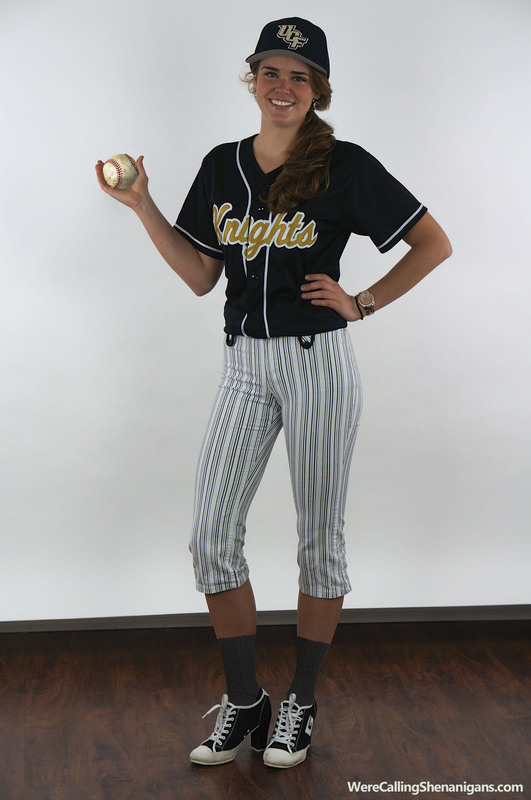 Throw a few braids in your hair and grab some neutral clothing and you’re all set! Check out this video to see how we did this hairstyle on our friend Sam. If you’re wanting to dress up as something powerful but Game Of Thrones isn’t your thing, you could easily pull together a Katniss Everdeen costume from The Hunger Games like Kristen does here. Check out this post to see how. One year I decided to run to Wal-Mart only a few hours before a costume party. I saw a package with bunny ears and a tail for $5. It reminded me of a picture I saw on Pinterest of a girl dressed as an engineer bunny. I grabbed a package of batteries with the bunny on it and wondered around the store looking for accessories. I Made the drum out of poster-board, duct tape, and stove top covers (also $5), and paid $3 for some tights. It turned out to be a big hit! With only running shorts, a corset and a veil, you can make yourself into an adorable runaway bride! 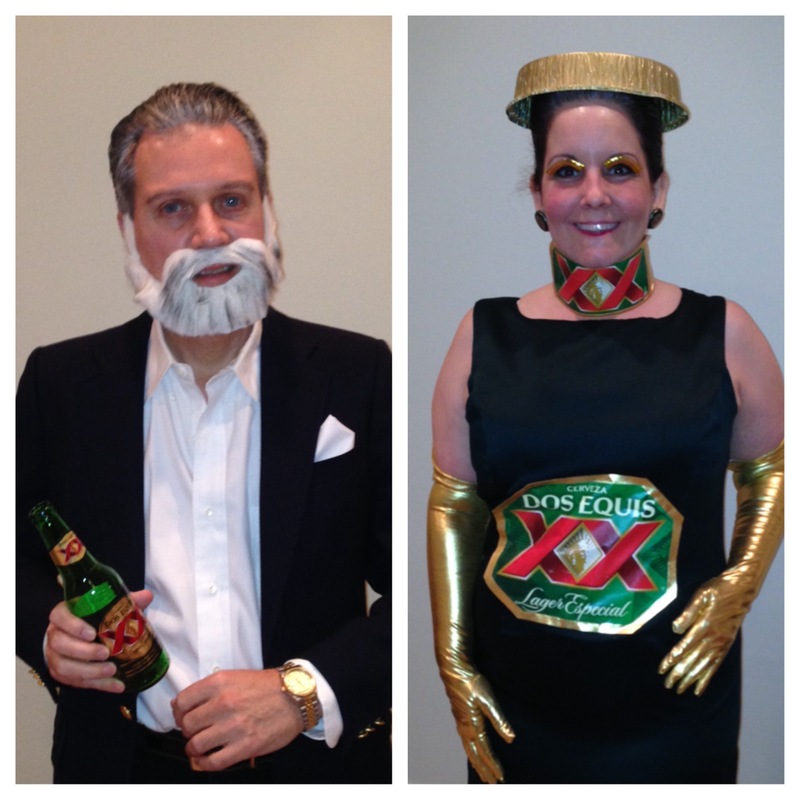 I think my favorite costume of the year goes to Amelia’s parents: her dad dressed as The Most Interesting Man In The World and her mom was a bottle of Dos Equis! Now I know where she got her Halloween creativity! 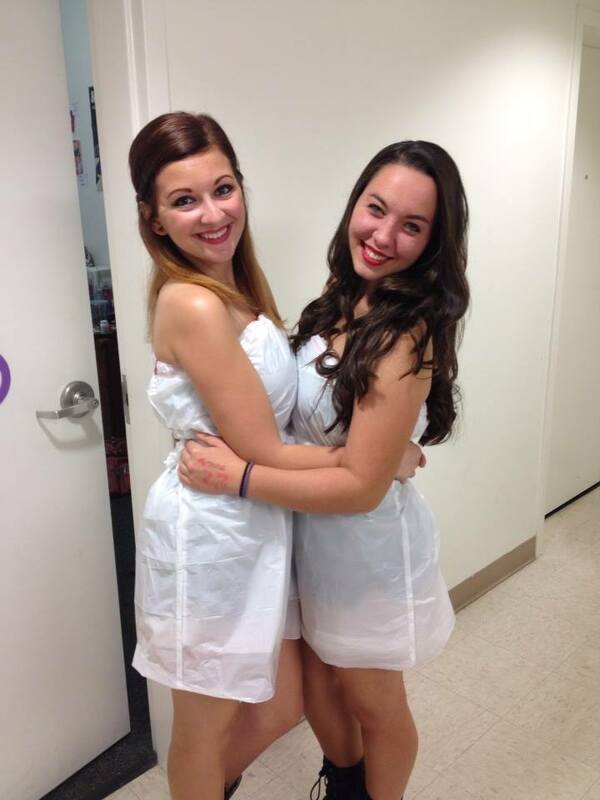 If you’re really on a budget, you can be like our friends Sami and Sarah and be “white trash.” All you need is a normal trash bag! 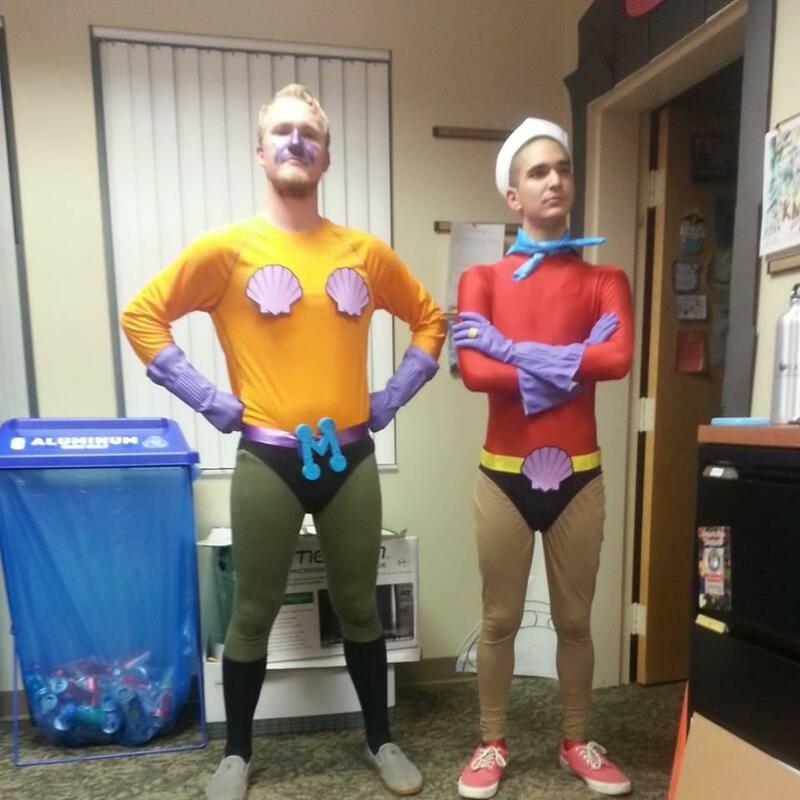 If you want to get a little more involved, you could take inspiration from our friends Nick and Josh and be Mermaid Man and Barnacle Boy from Spongebob. Aren’t they the perfect pair? How cute is this! Grab a big tin disposable pan from your local grocery store, paint it green and glue on some straps! Add a red headband and matching arm bands (you can use pre-wrap or sweat bands) and you are good to go as an adorable ninja Turtle! Okay, so this one may not be great for last minute, but it’s pretty hilarious. Our friends Ben and Tony decided to make a lovebug costume, which included an antenna hat, a vest with wings and two pairs of pants that were actually sewn together. (Also Amelia made herself into an adorable lion by braiding her hair to make ears). Tweet your clever Halloween costumes to @shenanometer, or post them on our facebook page so that we can add them to the list! We hope that you find inspiration from one of these many ideas! And that your Halloween is fun and safe!